The astute investment and management of Helen’s original bequest has enabled HMSTrust to approve average annual grants totalling more than $5m over the past 15 years. By June 2017, 4,688 grants totalling $117,346,075 had been approved by the Trustees. Adjusting for inflation, this has the equivalent buying power today of $177m. Helen’s personal philanthropy has guided HMSTrust’s grantmaking strategy from its earliest beginnings. Helen M. Schutt (Helen’s married name) appears regularly in the listings of charitable donations made to various causes in The Age and The Argus newspapers from 1916 to 1944. 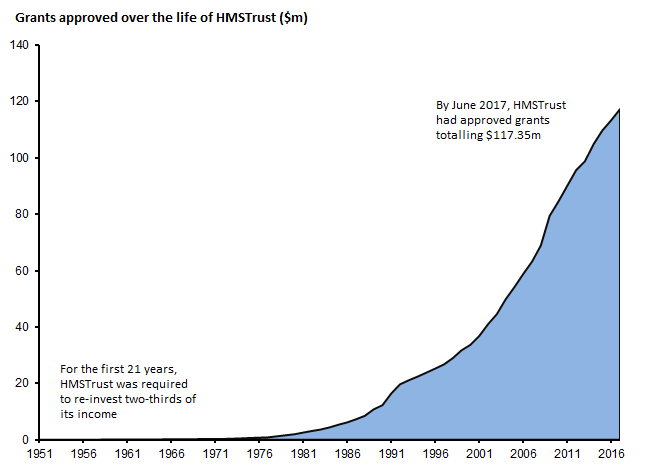 Helen’s commitment to health, children, disadvantaged, regional Victoria and community renewal is reflected throughout HMSTrust’s grantmaking history. Helen Macpherson Smith’s spirit of generosity has touched countless Victorians over the last six decades and will continue to do so in perpetuity. Hers is a truly amazing legacy.